Video Replay: Cagayan de Oro Presidential Debate for 2016 elections - Balita Boss! The first presidential debates of the Philippines for the upcoming 2016 elections in May has been conducted at the Capitol University in Cagayan de Oro City on Sunday, February 21, 2016. This was the first of the three Commission on Elections' presidential debates. 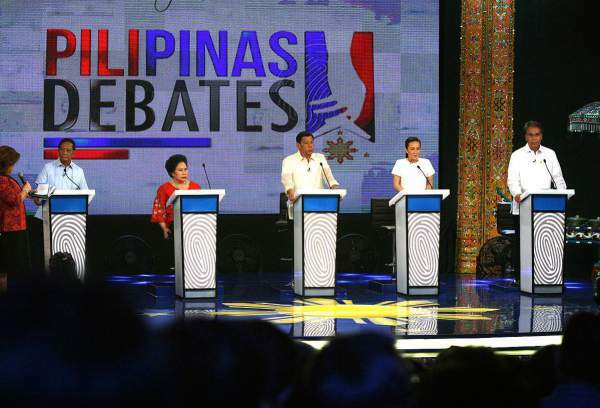 All five presidential hopefuls namely Vice President Jejomar Binay, Davao City Mayor Rodrigo Duterte, Senator Grace Poe, former Interior Secretary Mar Roxas, and Senator Miriam Defensor-Santiago were present at the debate. The Presidential debates was made through the effort and leadership of Comelec Chairman Andres V. Bautista and co-presented by GMA 7 and the Philippine Daily Inquirer. PiliPinas Debates 2016 was hosted by award-winning GMA anchors Mike Enriquez and Jessica Soho, together with John Nery, editor in chief of Inquirer.net. The second presidential debate is on March 20 at the University of San Carlos (USC) in Cebu City. This will be sponsored by TV5 and The Philippine Star. The third and final leg of presidential debate will be handled by ABS-CBN and Manila Bulletin on April 24 at the University of Pangasinan. The lone vice presidential debate will be on April 10 at the University of Santo Tomas (UST) to be organized by Comelec with the help of CNN Philippines, Business Mirror and Rappler. The full video replay above is courtesy of Inquirer.net.